Before opening them, I pictured them as little slices of pie, like the illustration on the front. The front states they are gluten-free, vegan, and non-GMO. On the back, they all had the same quote from Betty Lou. You can find the nutritional info and ingredients of each on their site here—just click the fruit bar image, then the Description tab. 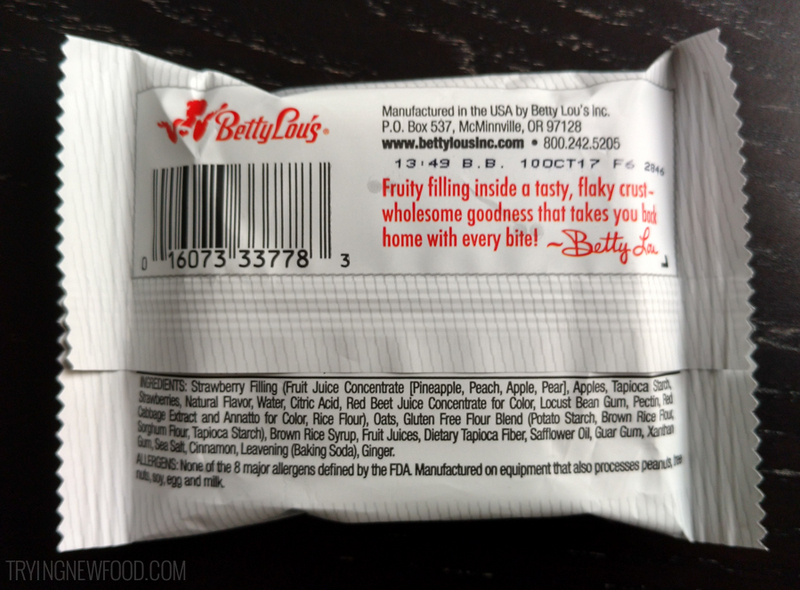 I saw Betty Lou’s also sells Tropical Pineapple Coconut and Blackberry. Hopefully our Wegmans will start carrying those flavors as well. When opening up each package, I was impressed that they were quite easy to open. No struggle at all. 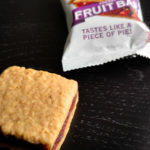 The fruit bars were uniform in look and reminded me of a large, square Fig Newton. 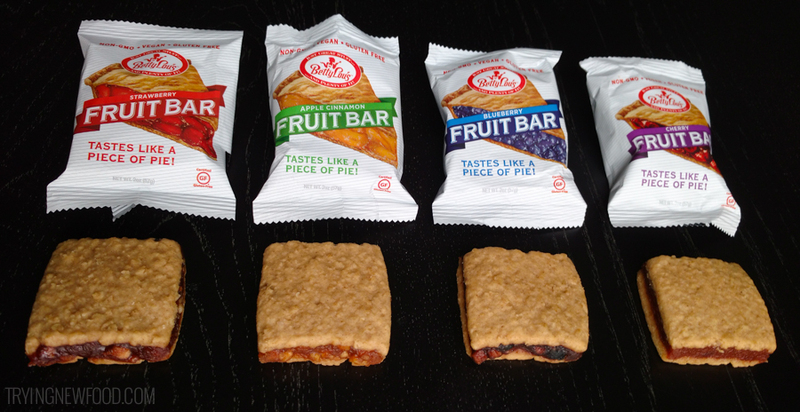 The Strawberry fruit bar was my favorite of all four. Not only did it taste of strawberry, but it had more depth in flavor than I was expecting (maybe the ginger and cinnamon?). 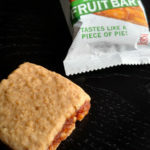 Next was the Apple Cinnamon fruit bar, which was enjoyed by both myself and my husband. It wasn’t as powerful a flavor as the others, but it did taste like a standard apple pie. The Blueberry flavor was loved by my husband, but it was my least favorite. 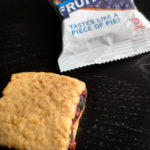 I am so used to the fake blueberry flavoring in other products that this was closer to a fresh blueberry pie. Props to Betty Lou. With the Cherry fruit bar, it had a very strong cherry flavor. Loved by my husband, but not me. Maybe I set the bar too high since cherry pie is my favorite pie. 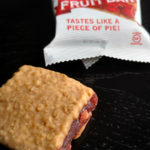 Plus I had already tried the strawberry fruit bar and fell in love. For only $1.49 each at our Wegmans, they are a delicious, gluten-free dessert that we’ll buy again in the future. 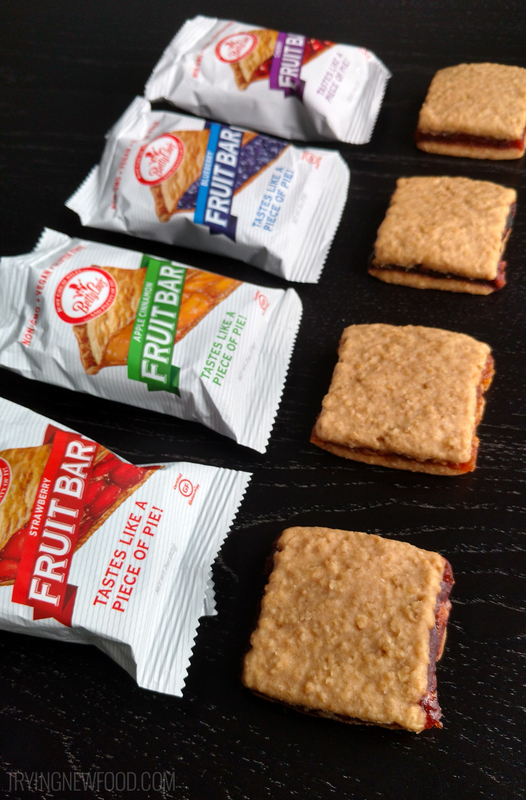 Next time we’ll just split one, since each has around 23g of sugar and 200 calories. 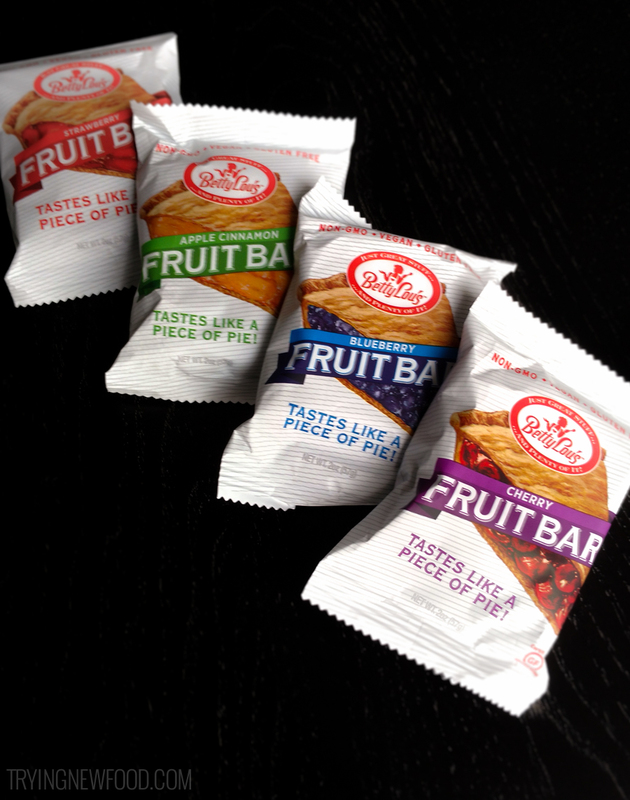 Have you seen or tried any of Betty Lou’s fruit bars? Let me know in the comment below where you spotted them, or if you’ve tried them—what did you think?